Wajãpi is the name used to designate the Indians who speak this Tupi tongue, and live in the region delimited by the rivers Oiapoc, Jari and Araguari, in Amapá. They are the same Guaiapi mentioned in the lower Xingu region, which is their provenance since the 17th century. The Indians recognize the word Wajãpi as the comprehensive designation of all subgroups which live in this area, corresponding, therefore, to the people’s self denomination. They also use as their self-denomination the expression iane, meaning us. In their provenance myths, the Wajãpi position themselves as a globally differentiated ethnicity from other peoples they know: the Brazilians (karai-ku), the French (parainsi-ku) and the neighboring indigenous groups (Wayana-Aparai, Tiriyó, Karipuna, Galibi and Palikur). Tradition establishes that, in mythical times, all peoples lived together and were separated by the creator hero, Ianejar ("our owner"). Following this separation, the other ethnicities became distant, and since them the Wajãpi inhabit what they call "the center of the land." There they split into different groups which recognize each other as "kin." 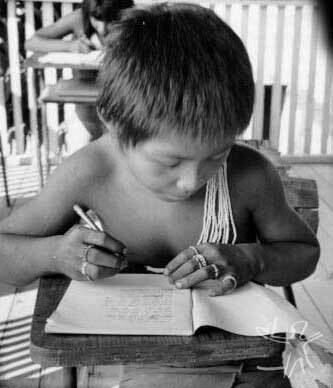 The language spoken by the Wajãpi is included in the Tupi-Guarani family. As the Emerillon of the Oiapoc river, they are the sole representatives of this linguistic family in the area. The knowledge of Portuguese by the Wajãpi is growing fast: in all villages there are from 5 to 10 men between 15 and 35 years of age who speak Portuguese well. Women and children, with rare exceptions, do not speak this language, although they understand most of the dialogues. There are Wajãpi also in French Guyana, whose language has dialect differences at the phonetic and lexicon level due to Karib language influences. Among the Oiapoc Wajãpi, most men speak French and many also know the Wayana language. The history of the Wajãpi over the past 250 years corresponds to this people’s migration North, since its original sites in the lower Xingu to their installation in the area they are settled in today. Over the past 100 years, this migration led them to abandon the main rivers, such as the Jari, to install themselves in the headsprings and tributaries of the Jari, Amapari and Oiapoc rivers. In these regions, they experienced different inter-tribe and inter-ethnicity relationships, which entailed the differentiation of the present Wajãpi subgroups. In 1973, the Amapari Wajãpi were contacted by a Funai attraction team which was working on the North Perimetral Highway (BR-210). When the highway construction works were discontinued in 1976, the final segment had already penetrated their indigenous land for over 30 km. The road, compounded by inadequate monitoring, opened the Wajãpi lands to the invaders: initially pelt hunters, then prospectors and more recently mining corporations, attracted by the important deposits of gold, cassiterite, manganese and tantalum in the region. At the same time, pressure was building in the limits of the area, to the extent that the margins of the North Perimetral were being taken up by sawmills, farms and prospection operations, fed from nearby urban centers (Serra do Navio, 90 km from the indigenous area, and Macapá, 370 km away). Since the 1980s, the Wajãpi decided to drive the invaders away from their territory by themselves. At the same time, they began territory control activities and diversification of the extractivism in the traditionally occupied area. 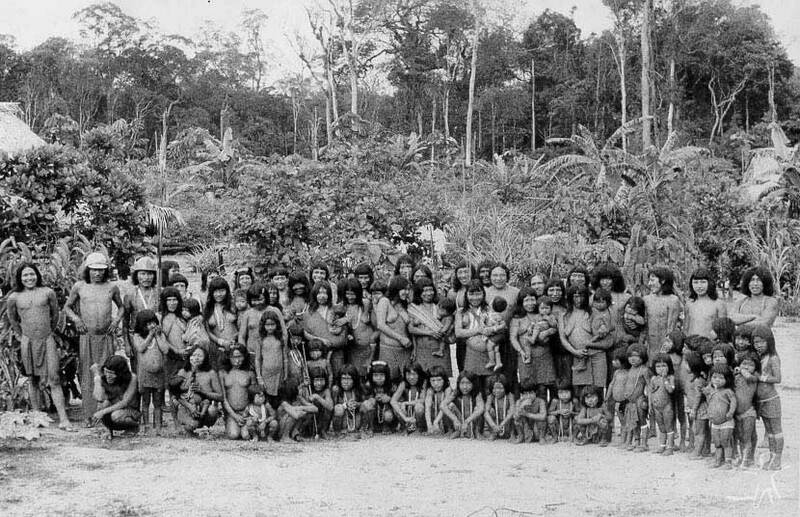 Subsistence difficulties in the overpopulated villages and those most affected by the nearness to the North Perimetral highway and consequently by the depletion of natural resources prompted many families to return to their traditional occupation sites, in areas distant from Funai stations and religious missions (MNTB - Missão Nove Tribos do Brasil, SIL - Sociedade Internacional de Linguística) which operate in the area, or to scatter in small villages located in a 5 to 20 km radius from the Stations. Presently, there are 13 permanent villages, besides many camps scattered throughout the indigenous area. 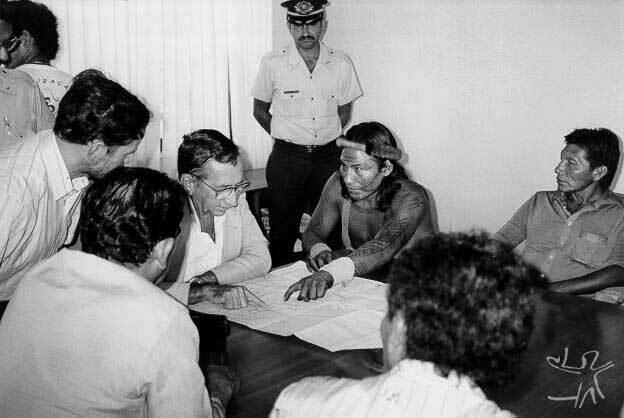 In 1990, Funai’s president interdicted the Wajãpi Indigenous Area, with 543,000, in the municipalities of Almerim, Mazagão and Macapá, in Amapá. In 1994, within the context of the PPG-7 and with the aid of the German government, the self-demarcation of the Wajãpi Indigenous Land began. In the same year, the Council of Wajãpi Villages was founded, gathering all the chieftains of large families, who nominated a governing body. This association is also called Apina, the name of a subgroup of this ethnicity known for their bravery in battle: they were the Wajãpi of the "far-reaching arrows". Their main objectives are to guarantee more intense, direct representation of the Wajãpi community with the authorities and to seek solutions to reorientate the relationship with the agencies acting in the area. The Wajãpi’s ceremonial life is intense, underlined by great ritual cycles such as the maize feast (in winter), the honey feast and the fish dances. These cycles comprise a methodical singing not always known to all, which entails meetings among communities for participation in the feast, involving the singing of and dancing to collective music, to the accompaniment of flutes of different types. In the course of these meetings, huge amounts of caxiri are distributed by one or two women whose husbands are the "owners" of the feast. Most of these feasts are profane in nature. Certain dances, such as the maize, the fish and the turé cycle dances contain distinctive ritual elements. They dance more often in crises times, to please and placate Ianejar, the creator hero, who always threatens to destroy humanity. On the other hand, those rituals associated with the initiation of girls are made within the families and rarely entail collective feasts. Agriculture is a collective activity in the Wajãpi life. The opening of clearings conditions the location of permanent housing and the pace of seasonal migrations; short, medium and long cycle produce contribute practically 50% of all foodstuffs consumed by the group. Agricultural work is done according to the traditional techniques of burning and coivara; the use of iron axes, to which the Wajãpi have had access only for 30 years modified the size of the clearings, according to them, but did not change the pace of agricultural work. Burning and clearing the fields are collective activities, in which a family leader is helped out by other community members in a joint effort called pusirõ. In the fields, the cultivated species are planted without apparent sequence. There is a clear emphasis on wild cassava, whose sub-products -- flour, beiju, tapioca, tucupi and caxiri -- are basic staples. Other cultivated species are corn, banana, yams, sweet potato, sugar cane and fruit such as cashew, papaya, pineapples, besides pepper, peanut and beans. The Wajãpi also grow cane for arrow shafts, curauá, which yields fiber for ropes, fishing poison, cotton, bowls and gourds. Of each species, the Wajãpi know myriad varieties: over 15 types of wild cassava, 10 types of potato, another 10 types of yams, 5 types of corn, and so forth. The Wajãpi have settled over two centuries ago in a vast area in the outer limits of Brazil and French Guyana, delimited by the Jari, Oiapoc and Araguari watersheds. On the Brazilian side, they are split into three territorial subgroups: the group in the upper Jari/Cuc, the "unsociable" group in the upper Ipitinga and the main group in the Amapari region. 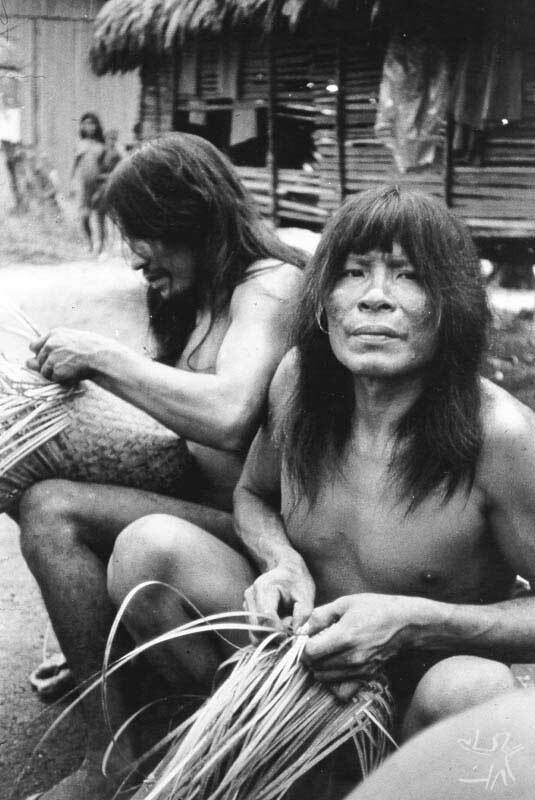 The upper Jari group dispersed between 1967 and 1981; most migrated into French Guyana, populating villages located on the banks of the Oiapoc river, and others were transferred by Funai in 1982 to the Tumucumaque Indigenous Park. At the time they numbered 10 individuals. Outside the Wajãpi Indigenous Land, there is news of two isolated subgroups of the same ethnicity, which supposedly settled in the headsprings of the Amapari and Anakui rivers, in Amapá, and the upper Ipitinga river, in Pará. There is scant information available on these two subgroups. 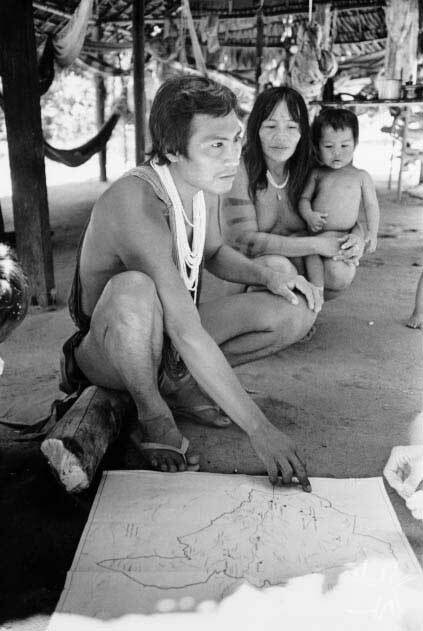 In 1975 Funai made an overflight of the area and located a huge hut with an estimated population of 80 individuals. The Amapari region is the present area of concentration of the Wajãpi who live in Brazil. It corresponds to the region delimited West by the river Inipiku (Mapari), South by the river Karapanaty (Aroã), a tributary of the lower Inipuku, and East by the igarapés Onça and Kumakary (Água Preta), tributaries of the Felício river, which flows into the Amapari. This area is located in the municipalities of Mazagão and Macapá, in the state of Amapá. The area hosts a dense rainforest area, where small waterways prevail, all of them full of rapids. The region is extremely uneven and broken, and consists of a sequence of hills and some flatlands, located at the foot of the Iratapuru, Ipitinga and Tumucumaque ranges. Soils are predominantly acidic, argilliferous and sandy with a high erosion risk. Climate is equatorial, warm and wet, which changes from rain season between January and July (winter) and dry season from August to December (summer). The make up of the Wajãpi village is not constant: the members of the local group are constantly on the move among villages and provisional homes built by the fields. Political schisms and meetings of members of different groups contributes for the constant reunification of the population of the villages, as well as disease outbreaks, deaths and intermittent prospector invasion problems. The agricultural cycle and the depletion of game also influence the migration of the Wajãpi throughout their territory. The Wajãpi village does not have a characteristic format; the huts are scattered in the space delimited by the igarapé or by the river and by the fields, and an enclosure (okara) is left free for social activities and rituals. Each hut corresponds to one family nucleus or, in rare cases, to one extensive family, housing between 4 and 7 individuals in the average. Traditional huts are palafitte-type built on studs up to two meters high; access to the floor is gained through a ladder carved out of a tree trunk. The two-sided roofing is made of ubim leaves and black straw. They presently are being replaced by large low-rise buildings, without walls, or by simple, rudimentary, provisional tapiris. Besides the homes, all villages also have, in the proportion of one to three or more huts, buildings which serve as kitchens, with gantries and hearths and all tools necessary for cassava processing. These buildings serve several family cores and mothers and daughters meet together to prepare food in them. 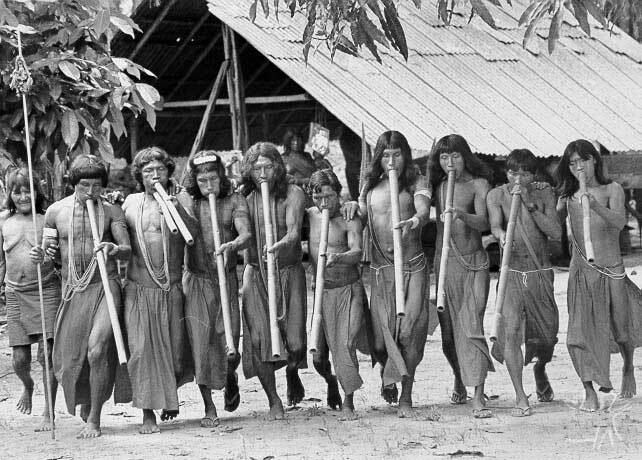 Demographics for the past 25 years indicate that the Wajãpi have had a constant population growth, and the birth rate increased significantly in the years following contact with Funai in 1973. By that time they were 151 individuals in Brazil. Fifteen years later, they numbered 310. Today they are 525 in Brazil (1999 census) and 412 in French Guyana (1992 census), for a total population of approximately 937 individuals.